A suite of refurbished laboratories in my department (Physics and Astronomy, University of Sheffield) was formally opened yesterday by Dame Julia Higgins, chair of EPSRC and Vice President of the Royal Society. The labs were refurbished with money from the Wolfson Foundation and the Royal Society and now house Maurice Skolnick’s work in semiconductor nanotechnology, as well as my own group’s labs. We marked the occasion with a set of scientific seminars. It’s always interesting to get an update on what one’s colleagues are up to, and Maurice’s talk had some stunning examples of recent progress in semiconductor nanotechnology. I’ll show just one example. 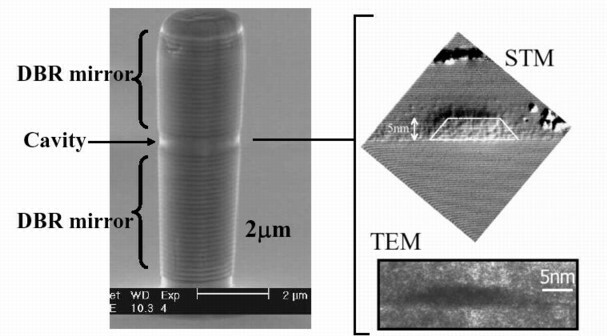 The picture shows (left) a very small diameter photonic micropillar – one can make out a central enclosure, the cavity, sandwiched between two distributed Bragg reflectors (DBRs). These are multilayers of different semiconductors which behave as near-perfect mirrors for light; photons generated inside the cavity are essentially trapped by the mirrors and the edge of the pillar. Simply to make these intricately structured micropillars is enough of an achievement (these were made at Sheffield by A Tahraoui and P W Fry). But within the cavity there is a further level of control. The pictures on the right show individual quantum dots, grown by self-assembly. These are incorporated within the cavity of the structure on the left (the transmission electron micrograph, labelled TEM, comes from Hopkinson and Cullis at Sheffield, the scanning tunelling micrograph, labelled STM, from Skolnick’s collaborator P.M. Koenraad at Eindhoven). The resulting structure simultaneously exploits the quantum effects that occur when electrons are confined within the quantum dots, with the optical confinement effects that occur when photons are trapped within the cavity. This allows simultaneous control both of the energies of electronic states in the quantum dot and of the way transitions between electronic states are coupled to the emission of light. Quantum dots of this kind are already used to make solid state lasers for use in optical communications. What is really exciting Maurice and his colleagues, though, is the possibility that this kind of structure might be used as the basis for a quantum computer. Quantum computers, if one could get them to work, offer the possibility of massively parallel computing of a power unparalleled with our current CMOS technologies. The problem is that one has to keep quantum states isolated from the environment enough to work their quantum magic, but one still has to retain the ability to interact with the states enough to provide some kind of input and output to the computations. This kind of structure, with its very close control both of the states themselves, and, via the photonic control, of their interactions with the outside world, may just possibly do the trick.